The Antioch Water Park opens Friday, May 25th, 2019. Get your season pass today. Spring programs including swim lessons and water aerobics begin April 2nd. Offices open at 8:30 am Mon-Fri 11:00 am on weekends Park opens at 11:00 a.m during the summer Park is open Memorial Day weekend and closes Labor Day weekend. Registration desk closes at 5pm. Park closes at 6pm. Do I have to pay if I am not swimming? Yes. The Park is admission based so you will need to pay to enter. How old must you be to receive the senior discount? Do you sell sunscreen? How much? Do you sell swim diapers? How much? Yes, the machine is located in the front women’s bathroom. I. We have large group and small group discounted tickets. II. Large group tickets are offered to groups of 50 or more Monday-Friday ONLY at $11 per ticket. III. Small group tickets are offered to groups of 10 or more at $12 per ticket on weekdays and $14 per ticket on weekend. IV. All groups must fill out a reservation form and make payment three day prior to your group reservation. V. Additional tickets may be purchased on the day of at the discounted rate for groups that have unexpected last minute guests. I. We offer food packages, shade areas and seating areas. III. Food packages are only available as an add on to group tickets. IV. Seating areas are available. We have 4 picnic areas for groups. Available from 11:00am-2:15pm ($35), 2:45pm-6:00pm ($35), or all day for $65. V. Shade structures are also available for those looking to take in a little less sun. We have 3 small shade structures with no table or chairs underneath. $50 per structure per day. VI. Party packages must be planned and paid for at least three days before the reservation date. Additional tickets will be available for purchase at the discounted rate the day of. .
How do I reserve discounted tickets? Check out the “Birthday and Groups” tab on the website or stop by the Water Park to complete a reservation application. Once your application is complete, submit payment It’s that simple! Please note: payment must be made at least three days prior to your event For example, if your party is on a Saturday your payment deadline would be Wednesday by 5:00pm. How tall do you have to be in order to ride the slides without a life vest? What do you offer at the Diablo Diner? Chips, hotdogs, corndogs, nachos, ice cream, soda, Icee’s, candy and more. How much is one swim lesson session? Swim lessons typically consist of 8 classes but can vary based on time of year and day of the week. Prices range: $76 for groups/ $120 for semi-privates/ $164 for private. Do you have family restrooms? Yes by the lap pool past the first aid and break room (past the small fence, across from Lap Pool). We do not allow alcohol, glass or knives into the park. Mylar balloons are not allowed inside of the park due to the power lines that are above the water park, it is a safety issue. Barbeques and hot plates will not be allowed into the park, it is a fire hazard. Animals are not allowed in the park due to health codes. When do you start hiring staff? January. We continue hiring through April and are always accepting applications for lifeguards. Yes! In and out privileges are available WITH WRISTBAND. 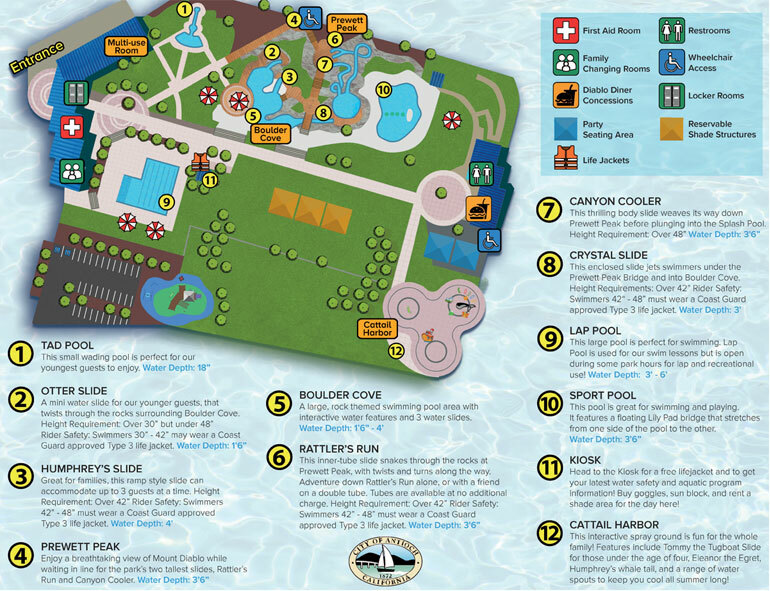 The Antioch Water Park is located on Lone Tree Way, across the street from Deer Valley High School, and adjacent to the Antioch Community Center. Rocks are for viewing only. No climbing. Wristbands are required for all guests over 30” tall and are mandatory for slide use. Replacement wristbands will not be provided. All bags are subject to search. Refusal to bag search may result to non-admittance to the park. No alcohol. No glass containers. Smoking of any kind is not permitted in the park. No pets are allowed in the park, with the exception of service animals. Service animals are not allowed in the water. Traditional swimwear is required. Provocative attire, street clothes, cut-offs, basketball shorts, gym clothes, and clothing with rivets, snaps, buttons, belts, or metal ornamentation are not permitted. Snorkels, face masks, and fins are not permitted. Guests are encouraged to wear water shoes while walking around the Water Park, but shoes are not permitted to be worn on any slides.